What act would that be, Mr. Randazzo? If you’re implying that Lloyd has some sort of reputation (which considering his limited history as a manager, is highly unlikely) that would mean you are using that against him – which would be highly inappropriate. Now, this is NOT to say that the umpire was the SOLE reason for the M’s losing this game (Mr. Price had a little something to do with that) BUT, had the strike zone been consistently called (on BOTH sides) Felix may have been able to go longer and the M’s batters may have had more of a fair shot at the plate. UNhappy Felix day 😦 . . . The M’s gave up more than THREE runs for the first time in August and the bullpen showed they aren’t invincible either . . .
Not much going vs. Mr. Price (only THREE hits) – but they weren’t without their chances . . .
Ump show in Detroit. It doesn't matter if batter has something in his eye. You don't grant time mid delivery. What a joke. Felix gives a glove wave at Randazzo after striking out Kinsler. 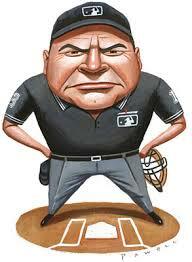 Don't usually complain about umps, but whoever is behind the plate for the M's game is just plain awful. Felix with dismissive wave as he walks off the field pointedly not looking at Randazzo. Cano puts arm around him. Line for Felix 5 IP 7H 2R 0BB 3K. Threw 92 pitches, 63 were called strikes. Others were not. Just the second time Felix has failed to go at least six innings this season. The other time was on May 2 against Houston. This entry was posted in GameDay, ROAD and tagged Beimel, Cano, DET, Felix, Maurer. Bookmark the permalink. ← g121 | half game lead for the second wild card . . .